Hola! We finished up our last work day and are getting ready for our very last day in Piura. Early Sunday morning we will leave for Lima where we will spend the day sightseeing before heading back to the States. It’s definitely a bitter-sweet feeling; we’ve have had such an amazing experience here and are really sad to leave the people, but then again we miss our families back home. Time has definitely flown by – it does not seem like we have been together for a week and a half already…but it’s been fun! So, yesterday was Fr. Lillard’s birthday (!! ), so we celebrated greatly. In the evening we went to the Hogar (the home for orphaned girls), where we had a party. When it came time to say goodbye it was really difficult because each of us had become attached to one of the girls there, and it would probably be the last time we see them on this trip. There were many tears from both missionaries and the girls at the Hogar. We will definitely miss them a LOT. Going to the Hogar was always such an amazing experience because they were so happy and even though there was a great language barrier, we still knew that they loved having us, and we LOVED being there with them. We’ve never met girls with so much happiness even though their families, backgrounds, living conditions, and such were not the ideal. The Hogar was definitely one of the highlights of Peru! Other things that have been happening? Lots! 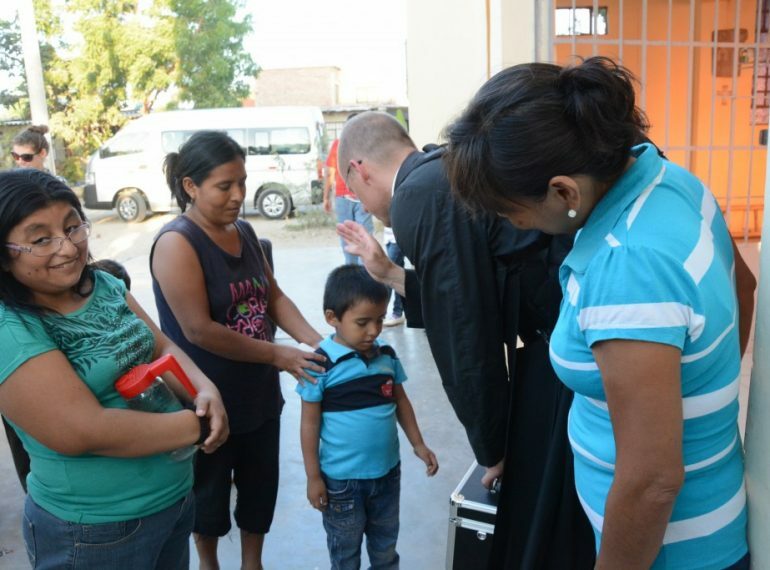 We’ve had four Masses each day, and usually they would be in the different outlying villages near Piura. It was amazing to be able to bring the Mass to people who didn’t have it regularly. One of the parishes that Mass was said at today said they couldn’t remember the last time Mass had been said in their chapel. We’ve made a lot of friends, both within the group and the local people. It will for sure be sad when we have to say goodbye. Well, ciao for now! We’ll see you all in about 3 days!!!! God bless!